123FormBuilder (formerly 123ContactForm) Review: "It really is as easy as 123!" I needed to collect all kinds of information from customers interacting with our website, but it wasn't the same information each time. Depending on the circumstances surrounding each customer, I had to collect different information. 123FormBuilder made is so easy to create all the different templates I needed, always picking up where I left off instead of rebuilding things from scratch. 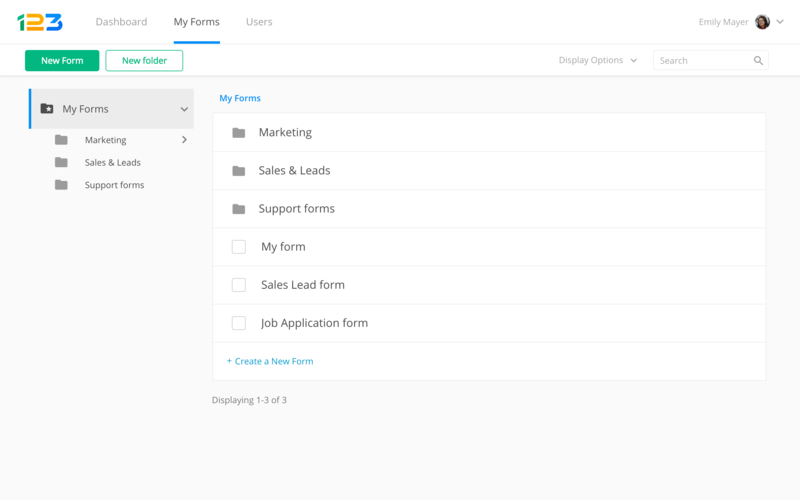 Data collection and sorting was a breeze, forms were customizable and easy to create, and all in all I don't think I've used a better product for form building. From a functionality perspective, it was really good, though I'd have liked a realtime editing feature. Meaning, I'd like to have been able to see changes on a preview form as I made changes. That would've save a lot of back forth, especially initially. 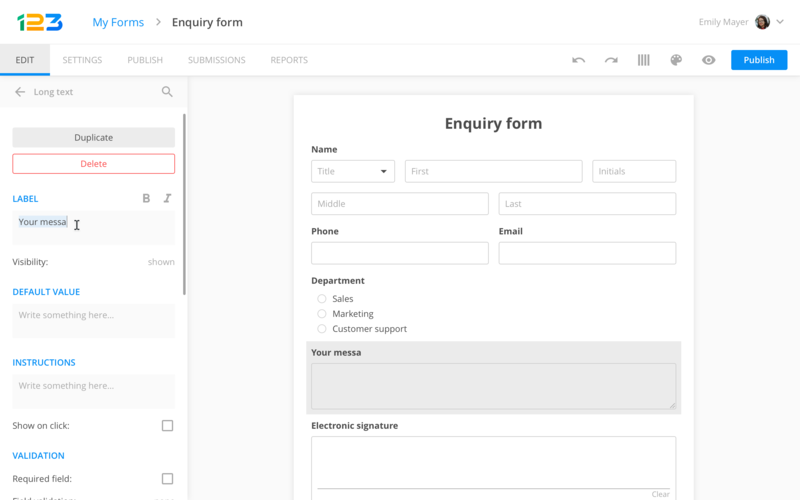 123FormBuilder (formerly 123ContactForm) Review: "Full Form - Ideal Software for Form Building & Surveys"
We are essentially a small organisation with various needs that range from travel requests to reimbursements & supplier/client registrations and payments logging. We also run surveys to understand market potential & customer attitudes on behalf of clients. We use 123ContactForm across our company for collecting data in tabular form where otherwise it would be dissipated, unstructured & manually entered into various accounting, monitoring & management systems. The survey usage ensures that we have structured data for analytics & presentation to clients. 123FormBuilder (formerly 123ContactForm) Review: "123ContactForm can be life.... Maybe"
DMC is currently using archaic methods for requesting data from their analytics department. More than 90% of their requests came through email and lacked the details necessary to complete a request without seeking more info. 123ContactForm was used to create request forms that allowed employees to provide specifics based upon what a standard request would provide. It also allowed the user to expand on their request by providing in depth details that would be missed if they weren't guided through leading questions. 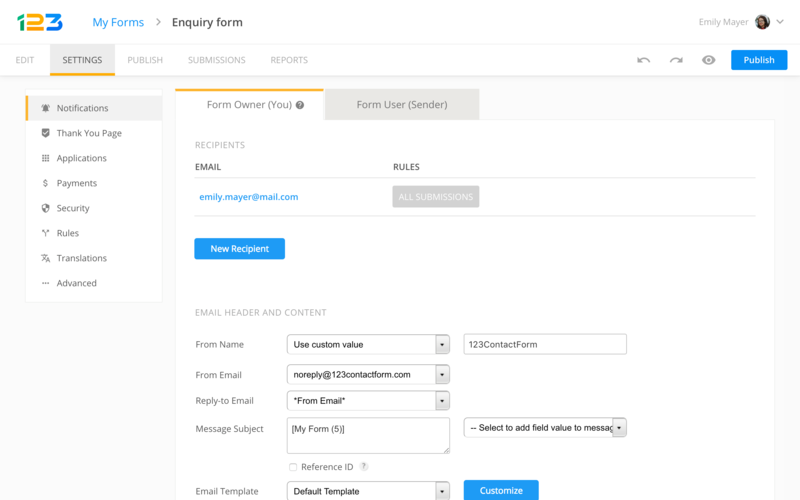 123ContactForm makes creating online forms and surveys a breeze. It comes with a free form-builder that you can even connect to other online platforms like MailChimp, Salesforce, and more. Data collection is automated through its robust features. 123ContactForm also offers numerous payment processes that you can integrate with an online form without having to resort to a shopping cart function. The program comes with a built-in analytics so that you can easily track online form performance and interpret data through graphical reports and efficient data mining. I found no drawbacks to using 123ContactForm. I believe when creating forms larger in scale, 123contactform would be well suited in terms of flexibility. It allows a creator that's familiar with HTML and inline CSS to manipulate the form to their will, providing them the desired outcome. 123FormBuilder (formerly 123ContactForm): "White Hat SEO Reviews 123ContactForm"
123ContactForm is being used by the SEO Department at White Hat SEO. We have found that it is easy to implement and easy for clients to make changes. This plugin is also great for clients to be able to access the data that consumers have submitted and apply to their CRM. Easy to make changes and easy to user interface. Design elements can be too simple. 123ContactForm is well suited for small businesses or smaller websites. Website owners that might not have development knowledge or the budget to hire a web developer can install 123ContactForm by themselves with little technical knowledge and receive communications from their users/visitors. 123ContactForm is great for WIX the CMS platform and similar CMS. 123FormBuilder (formerly 123ContactForm) Review: "Why you need 123ContactForm to take your business to the next level"
123ContactForm is used across the whole organization. We use it to create website landing pages and forms to get information from our customers, we use it for customer surveys, contact us forms, and private event detailed information collection forms. It is versatile and user friendly. Can I integrate this form easily into my website, blog, etc? 123FormBuilder (formerly 123ContactForm) Review: "How 123ContactForm can help your K-12 system"
It was used in a prior organization, which was my prior job. We used it for student and instructor contacts. It helped us keep up to date information on everyone. It also provided easy to use reports. We could build html forms with little or no html experience. This is empowering. We were notified right away when someone completed a form. This was helpful with scheduling workshops, among other things. The reporting feature was great, as it was easy for administrators to see results at a glance. Some employees are intimidated at first. After all, it is html. There is so much functionality that it can be easy for novices to get lost. Will there be more payment flexibility? parents use more of the bank to person payment options. This is great for setting up workshops and trainings. You know right away when people sign up so you can send out materials. The reporting is useful when meeting with colleagues or administrators. You can easily customize them to meet any need. It can be useful when collecting payments for events, such as field trips or prom. You just need to specify how payment can be made, as not all payment types work with this. 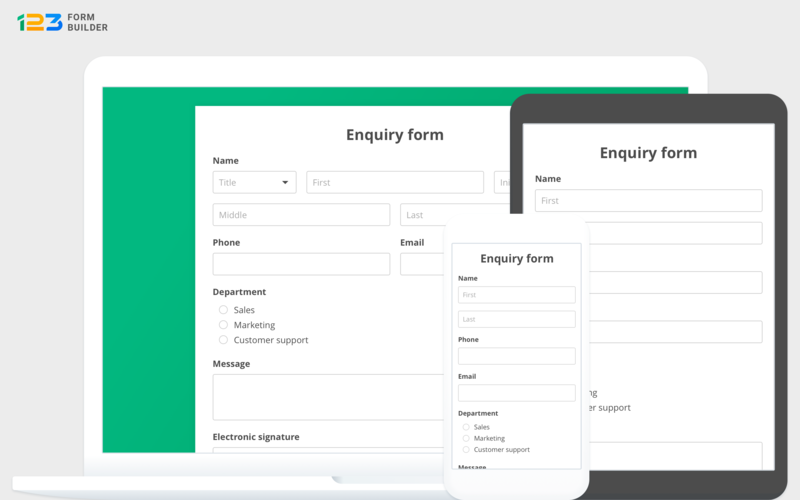 123FormBuilder (formerly 123ContactForm) Review: "123ContactForm saves development costs"
It is being used on our website and landing pages across our business. It is a simple and effective way for our company to have enquiry forms that were not only easy to create but covered off on all the questions we required for business leads. The simplicity of setting up enquiry questions for someone with limited coding experience was without doubt the best feature. There were just so many different options that covered off on all the tasks we required. You need to be able to give your customers i.e. me the ability to be able to send an SMS to the consumers filling in our enquiry forms. 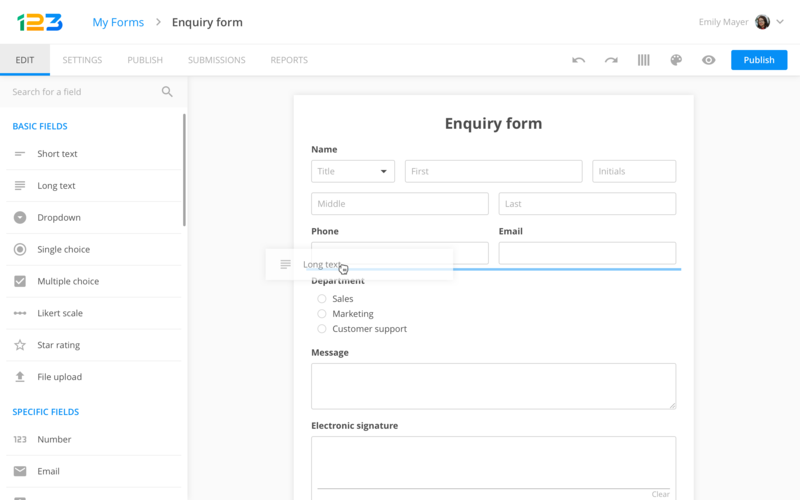 With my business and the questions we wanted to ask our customers the process of setting up the enquiry form was simple. 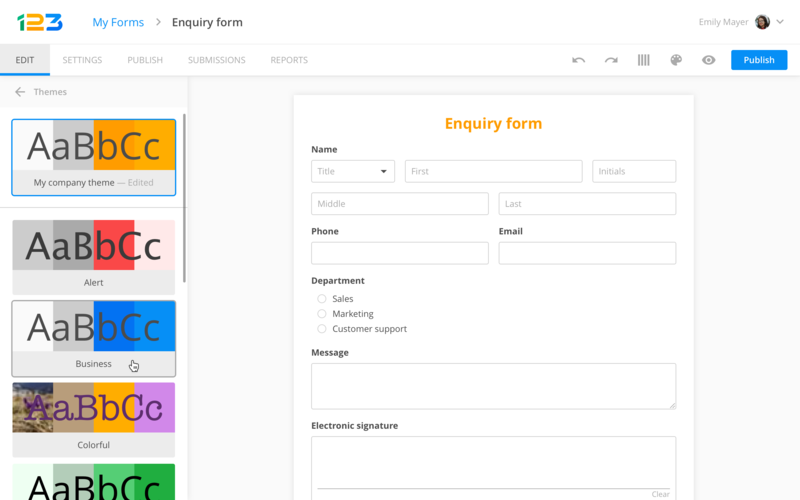 123FormBuilder (formerly 123ContactForm) is an easy to use online form builder that requires no coding skills. Any type of web form can be built in just 3 steps and customized very fast. The tools is integrated with Google Drive, HootSuite, Marketo and many others. Interface: English, Dutch, German. Web forms: all langauges.